जन्म से कुछ ही दिनों बाद मैरी का पास के ही गिरिजाघर सैंट माइकल्स पैरिश चर्च, लिन्लिथगो में बैप्टिज़्म किया गया। हालांकि अफवाहे थीं की यह सब ढंग से नहीं हुआ था।  एक अंग्रेज कोटनीतिज्ञ रैल्फ सैडलर ने मार्च १५४३ में लिन्लिथगो महल में एक नवजात को नर्स के हाथ में देखा था और लिखा कि "इतनी सी उम्र के इस बच्चे की तरह का कोई मैंने पहले कभी नहीं देखा जो जी भी रहा है" it is as goodly a child as I have seen of her age, and as like to live. "अपनी आत्मा में झाँक कर देखें और याद रखें कि इस दुनिया का रंगमंच, इंग्लैंड के साम्राज्य से कहीं अधिक बडा है।"
Assessments of Mary in the sixteenth century divided between Protestant reformers such as George Buchanan and John Knox, who vilified her mercilessly, and Catholic apologists such as Adam Blackwood, who praised, defended and eulogised her. After the accession of James I in England, historian William Camden wrote an officially sanctioned biography that drew from original documents. It condemned Buchanan's work as an invention, and "emphasized Mary's evil fortunes rather than her evil character". Differing interpretations persisted into the eighteenth century: William Robertson and David Hume argued that the casket letters were genuine and that Mary was guilty of adultery and murder, while William Tytler argued the reverse. In the later half of the twentieth century, the work of Antonia Fraser was acclaimed as "more objective ... free from the excesses of adulation or attack" that had characterised older biographies, and her contemporaries Gordon Donaldson and Ian B. Cowan also produced more balanced works. Historian Jenny Wormald concluded that Mary was a tragic failure, who was unable to cope with the demands placed on her, but hers was a rare dissenting view in a post-Fraser tradition that Mary was a pawn in the hands of scheming noblemen. There is no concrete proof of her complicity in Darnley's murder or of a conspiracy with Bothwell. Such accusations rest on assumptions, and Buchanan's biography is today discredited as "almost complete fantasy". Mary's courage at her execution helped establish her popular image as the heroic victim in a dramatic tragedy. ↑ पादरी जॉन लेस्ले ने बताया कि मैरी का जन्म ७ को हुआ, लेकिन मैरी व जॉन नॉक्स ने ८ कहा जो कि वर्जिन मैरी के अमलोद्भव की दावत का दिन था( Fraser 1994, पृष्ठ 13; Wormald 1988, पृष्ठ 11). ↑ यह संसकरण रॉबर्ट लिंडसे के The History of Scotland from 21 February 1436 to March 1565 नामक पुस्तक से लिया गया है जिसे १५७० में लिखा गया था। इस वाक्य को सबसे पहले जॉन नॉक्स ने १५६० में सुना और लिखा था "The devil go with it! It will end as it began: it came from a woman; and it will end in a woman" यानि राक्षस इसके साथ जाएगा! यह वैसे ही खत्म होगा जैसे शुरु हुआ था: यह एक महिला से आया; और एक महिला में ही खत्म होगा। ( Wormald 1988, पृष्ठ 11–12). ↑ Guy 2004, पृष्ठ 41–42; जीन डी संत मौरिस नीदरलैंड की राज्यपाल को २५ अगस्त १५४८ को हुमे, मार्टिन ए. एस. ; टाइलर, रोयल, संपा॰ (1912). Calendar of State Papers, Spain: Volume IX: 1547–1549. लंदन: हर मैजेस्टीज़ स्टेशनरी ऑफिस. पृ॰ 577. ; लिखते हैं। लॉर्ड गुथरी (1907). "Mary Stuart and Roscoff" [मैरी स्टुअर्ट और रॉस्कॉफ़] (PDF). Proceedings of the Society of Antiquaries of Scotland. 42: 13–18. ↑ Weir 2008, पृष्ठ 12; Wormald 1988, पृष्ठ 77; कैथरीन की मैरी के प्रति नापसंदगी हेनरी २ की मृत्यु के बाद ही सबके सामने आई( Fraser 1994, पृष्ठ 102–103, 115–116, 119; Guy 2004, पृष्ठ 46)। कैथरीन के हित गुइज़ परिवार के हितों से टकराते थे और दोनों रानियों में एक संभावित ईर्ष्या व प्रतिद्वंदिता की भावना रही होगी।( Donaldson 1974, पृष्ठ 50–51; Fraser 1994, पृष्ठ 102–103, 116, 119). ↑ अज्ञात (1558). Discours du grand et magnifique triumphe faict au mariage du tresnoble & magnifique Prince Francois de Valois Roy Dauphin, filz aisné du tres-chrestien Roy de France Henry II du nom & de treshaulte & vertueuse Princesse madame Marie d'Estreuart Roine d'Escosse (फ़्रेंच में). पेरिस: ऐनेट ब्रीयरी. ↑ टियुलेट, अलेक्ज़ेंडर (1862). Relations politiques de la France et de l'Espagne avec l'Écosse au XVIe siècle (फ़्रेंच में). 1. पेरिस: रेनोर्ड. पपृ॰ 302–311. ↑ थॉम्पसन, जेम्स (1909). The Wars of Religion in France [फ्राँस में धर्मयुद्ध]. शिकागो: शिकागो विश्वविद्यालय प्रेस. पृ॰ 22. आई॰ऍस॰बी॰ऍन॰ 978-1-4179-7435-1. ↑ नॉक्स, जॉन. History of the Reformation of Religion in Scotland [स्कॉटलैंड में धर्म सुधार का इतिहास]. 4 (विभिन्न, e.g., लेन्नॉक्स, कुथबर्ट (संपादक) (1905). लंदन: एंड्रयु मेलरोज़ संस्करण). पृ॰ 225–337. ↑ रेनी, जेम्स (अनाम प्रकाशन) (1826). 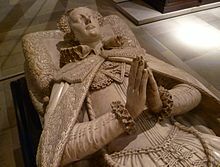 Mary, Queen of Scots: Her Persecutions, Sufferings, and Trials from her Birth till her Death. ग्लासगो: डब्ल्यु. आर. मैक्फ़न. पृ॰ 114. ↑ papal dispensation; A dispensation, backdated to 25 May, was granted in Rome on 25 September ( Weir 2008, पृष्ठ 82). ↑ पोस्ट मार्टम प्रतिवेदना में अंदरूनी घावों का जिक्र था जिसे विस्फोट का नतीजा माना गया। जॉन नॉक्स ने दावा किया कि जिन चिकित्स्कों ने डार्न्ले के शरीर की जाँच की थी वो झूठ बोल रहे थे और डार्न्ले की हमला कर के हत्या हुई थी। लेकिन सभी सबूत यही इशारा कर रहे थे की कहीं भी चोट के कोई निशान नहीं थे और चिकित्सकों के झूठ बोलने का कोई कारण नहीं था क्योंकि वैसे भी उसकी हत्या तो हुई ही थी चाहे जैसे भी हुई हो। ( Weir 2008, पृष्ठ 255). ↑ Weir 2008, पृष्ठ 447; मैरी ने बाद में वेस्टमिंस्टर में उपस्थित होने की गुहार लगाई जिसे एलिज़ाबेथ ने खारिज़ कर दिया। परिणामस्वरूप मैरी के आयुक्त सुनवाई से हट गये।( Weir 2008, पृष्ठ 461–463). ↑ दस्तावेजों की सूची के लिए देखें, उदाहरण, Guy 2004, पृष्ठ 397 और Wormald 1988, पृष्ठ 176; संदूक के बारे में जानए के लिए देखें रॉबर्टसन, जोसेफ (1863). Inventaires de la Royne d'Ecosse. एडिनबरा: बेन्नाटाइन क्लब. पृ॰ ५८. और Guy 2004, पृष्ठ 432. ↑ थॉमसन, जॉर्ज मैल्कम (1967). The Crime of Mary Stuart [मैरी स्टुअर्ट का गुनाह]. लंदन: हचिन्सन. पपृ॰ 148–153, 159–165. आई॰ऍस॰बी॰ऍन॰ 978-0-09-081730-6. ↑ अंग्रेजी में- "he meant never to marry with a person, where he could not be sure of his pillow". ↑ यह उनकी माँ का सूत्र वाक्य था।( Guy 2004, पृष्ठ 443–444). ↑ जॉन मोरिस (1874). Letter Book of Amias Paulet [एमियास पौलेट के पत्राचार]. पृ॰ 368–369. ↑ हचिन्सन, रॉबर्ट (2006). Elizabeth's Spy Master: Francis Walsingham and the secret war that saved England. लंदन: वेडेनफ्लेड व निकोल्सन. पपृ॰ 196–201. आई॰ऍस॰बी॰ऍन॰ 978-0-297-84613-0. Bingham, Caroline (1995). 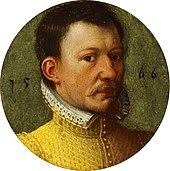 Darnley: A Life of Henry Stuart, Lord Darnley, Consort of Mary Queen of Scots. London: Constable. आई॰ऍस॰बी॰ऍन॰ 978-0-09-472530-0. Donaldson, Gordon (1974). Mary, Queen of Scots. London: English Universities Press. आई॰ऍस॰बी॰ऍन॰ 978-0-340-12383-6. Fraser, Antonia (1994) . Mary Queen of Scots. London: Weidenfeld and Nicolson. आई॰ऍस॰बी॰ऍन॰ 978-0-297-17773-9. Guy, John (2004). 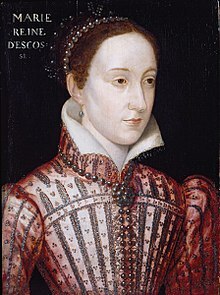 "My Heart is my Own": The Life of Mary Queen of Scots. London: Fourth Estate. आई॰ऍस॰बी॰ऍन॰ 978-1-84115-753-5. Lewis, Jayne Elizabeth (1999). 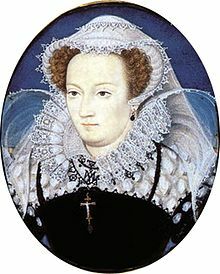 The Trial of Mary Queen of Scots: A Brief History with Documents. Boston: Bedford/St. Martin's. आई॰ऍस॰बी॰ऍन॰ 978-0-312-21815-7. Weir, Alison (2008) . 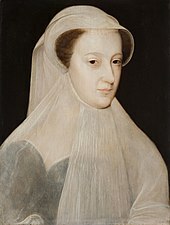 Mary, Queen of Scots and the Murder of Lord Darnley. London: Random House. आई॰ऍस॰बी॰ऍन॰ 978-0-09-952707-7. Wormald, Jenny (1988). Mary, Queen of Scots. London: George Philip. आई॰ऍस॰बी॰ऍन॰ 978-0-540-01131-5. Bath, Michael (2008). 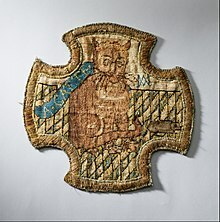 Emblems for a Queen: The Needlework of Mary Queen of Scots. London: Archetype Publications. आई॰ऍस॰बी॰ऍन॰ 978-1-904982-36-4. Marshall, Rosalind (2006). 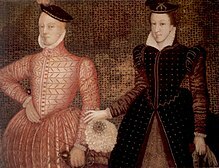 Queen Mary's Women: Female Relatives, Servants, Friends and Enemies of Mary, Queen of Scots. Edinburgh: John Donald. आई॰ऍस॰बी॰ऍन॰ 978-0-85976-667-8. Marshall, Rosalind (2013). Mary, Queen of Scots. Edinburgh: National Museums of Scotland. आई॰ऍस॰बी॰ऍन॰ 978-1-905267-78-1. Swain, Margaret (1973). The Needlework of Mary Queen of Scots. New York: Van Nostrand Reinhold. आई॰ऍस॰बी॰ऍन॰ 978-0-442-29962-0. Warnicke, Retha M. (2006). Mary Queen of Scots. New York: Routledge. आई॰ऍस॰बी॰ऍन॰ 978-0-415-29182-8. Wilkinson, Alexander S. (2004). Mary Queen of Scots and French Public Opinion, 1542–1600. Basingstoke: Palgrave Macmillan. आई॰ऍस॰बी॰ऍन॰ 978-0-230-28615-3. डीओआइ:10.1057/9780230286153. फुर्गोल, एडवर्ड एम. (1987). "The Scottish Itinerary of Mary Queen of Scots" (pdf). पीएसएएस. 117: 219–231.